The refugee crisis presents the EU with a big challenge. Especially Germany and Austria have to cope with it. In September 163,772 new refugees have been registered. Curse or Blessing for the labor market? The Balkaninvest-Team starts with this post a series of blogposts on this hot toppic! In Germany approved refugees with residence permit are allowed to work without restrictions. Additionally there is the suspension of deportation. The suspension is granted to refugees who are not deported although their asylum application has been rejected. 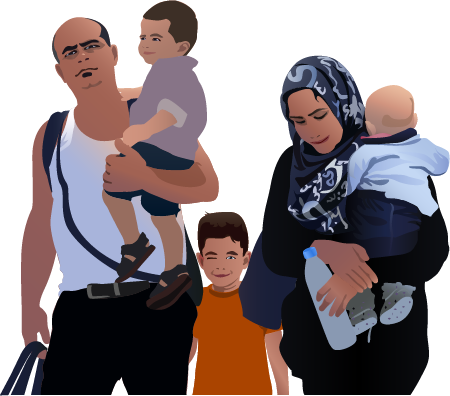 This refugees and refugees with residence permit have access to the labor market after three month. A disparity to Austria is the priority check. German employees or employees from the EU member states have priority over refugees for vacancies. But because of the current positive labor market situation and the high number of job vacancies (retrieved 9 September 2015) there could be changes in the priority check anytime soon. Beside country-specific differences in job training and practicing it is also important to consider that many refugees only have compulsory education and often are faced with problems concerning the Latin alphabet. Many of them have professions which almost do not exist any more in Europe like carpet makers or fishermen. Most do not own documents or credentials. In addition to that it can be difficult for them to work in a regulated work environment because of traumatic experiences and their consequences caused by the war. In the meantime there are offered online education and employment platforms like Workeer or Mygrade, which connect job seekers and employers and enable an easy application. Once a refugee is recruited it is advantageous to nominate an employee which cares about the special needs, concerns and problems and simultaneously enable them an easy entrance into the employment market.